Recreate your fun-filled adventures with new Starbucks Frappuccino® flavors – Mango Fruit Jelly Yogurt and Strawberry Fruit Jelly Yogurt. 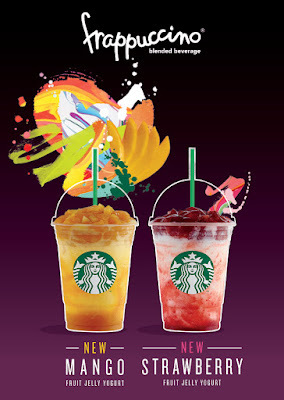 Starting July 26, get that much needed zesty boost with these new beverages boasting a delicious combination of chilled yogurt and fruity swirl blended with ice. “The all new Mango Fruit Jelly Yogurt and Strawberry Fruit Jelly Yogurt Frappuccino® Blended Beverages are a delightful combination of fruity taste in a sweet jelly, layered with the smooth texture of yogurt. Reminiscent of a creamy parfait, these Frappuccino® Blended Beverages are inspired by our customers’ love of sweet fruit, making them the ideal beverage to lighten up one’s day,” said Keith Cole, head for marketing at Starbucks Philippines. The honey - citrus sweet mango sauce in harmony with the tartness of the yogurt creates a refreshing boost on a hot day. The beverage is completed with a layer of Mango fruit jelly containing real mango bites. Yogurt is blended with strawberry sauce puree to create a smooth and delicious beverage that is a balance of sweetness from strawberry and the tart flavor of yogurt. The beverage is topped with a layer of strawberry jelly with strawberry bites that makes it visually irresistible. Available starting July 26 to September 13, 2016 with prices Tall – ₱ 160; Grande ₱ 175; Venti– ₱ 190.